Each year the Bachman’s Spring Ideas House marks the end of winter and welcomes a season of warmer weather and beautiful spring colors. The theme for the 2017 Spring Ideas House is Urban Farmhouse. This transformation from season to season takes place in the historic Bachman family home on Lyndale Avenue. Truly an urban farmhouse. A neutral background palette allows the colorful spring florals and accessories to be focal points throughout the home. If you’ve never been to an Ideas House the design team does an amazing job creating charming vignettes with new items, up cycled pieces, and vintage pieces. Your freshly painted room is looking gorgeous. In fact, you love the color so much, you don’t want any of it to go to waste! Have no fear, we’re here with some great ideas for using every last drop. 1. Freshen up a lampshade with a wash of color. Emily Henderson calls painting a shade with watered-down house paint “the simplest, most genius upgrade to a fabric lampshade that you can do.” She suggests a ratio of 1/3 water-based paint to 2/3 water. 2. Paint the back of your built-ins. 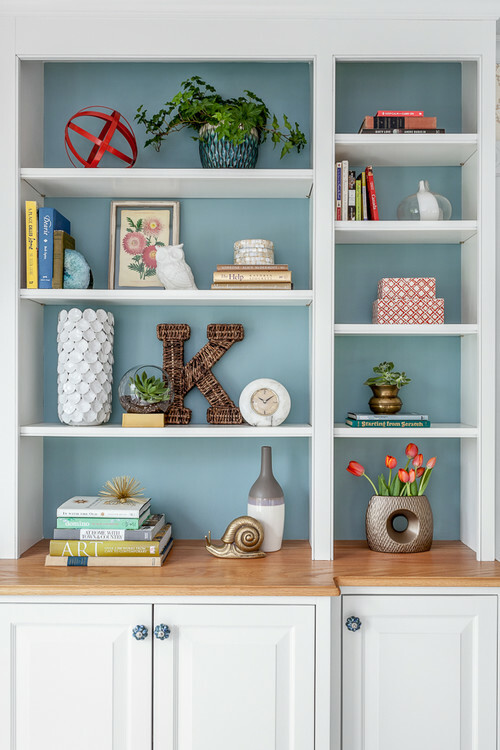 Painting the back wall gives shelving an added dimension — and gives you an excuse to use more of your favorite paint! Are you noticing more bookcases and built-ins featured in room sets, or is it just me? It’s no wonder “She Sheds” have become so popular – they are the ultimate personal retreat or workshops spaces, right in your own backyard. The functions are endless. You can use one as a studio for art, crafts, or sewing, let it double as a guest house, turn it into an outdoor living room, or make it your office! The forms are endless, too. Here are some of our favorite ideas for designing your own She Shed. To maximize light in a small space, swap out the barn doors with French doors (or leave them open), install a skylight or two, and paint the interior a bright white. The light will shine in, bounce off the white walls, and fill the space — no need for electric lighting on a sunny day! Add some color with accessories, furniture, and a bright rug. Halloween is just around the corner, and to invite those adorable trick-or-treaters, consider adding some Halloween décor to make your home festive and ready for the spooky holiday. Designing on a dime can be difficult given the price of furniture and interior décor. However, with the help of a little bit of paint, your old, outdated furniture can be refurbished to look like you spent the big bucks without putting a dent in your wallet! Here are a few ways that Hirshfield’s paints can transform your furniture and accentuate your space. Voila! The power of paint. Above, a simple and cheap coffee table has been completely transformed with a new coat of beautiful turquoise paint and decorative metallic corners. Adding a pop of color is a fun and easy way to incorporate color into an otherwise bland room, while also recreating a piece that may have gotten sent to the dumpster. Staying true to the modern feel with a paint compromise. Add some accents to an otherwise old and outdated end table. The after photo of the project above shows that a little bit of white paint can add sophistication and completely make over an old piece. Freshen up your furniture or thrift store finds with Cottage Paint from Hirshfield’s. Your color selection is limited to the 1,300+ colors found in the Hirshfield’s fan deck. Head over to Pinterest for color inspiration and ideas from DIY’ers all over the world. Have you seen these very cool fretwork panels called O’verlays? Attach a fretwork panel and turn a plain piece of furniture into the focal point of any room. They are made of a lightweight composite and are paintable. They can be used on windows, doors, mirrors, furniture, and more. There are so many ways that paint can transform your home. Get the look of expensive, luxurious furniture without having to make any sacrifices by purchasing some paint at your local Hirshfield’s and make your home the beautiful haven you’ve always desired. Remember how the Man Cave gained traction in the 90s? There was a general consensus that men needed a designated place to rest, grunt and watch football. Basements across the Midwest were converted from storage rooms to adult playrooms, accommodating the inner male child – bars, hunting themes and sports memorabilia popped up like wildfire. Well, I have come upon a new trend – backyard sheds. Nope, not those ugly sheds designed to house your tools and your mower; but rather a separate building designed for relaxation, entertainment and a refuge from the real world. 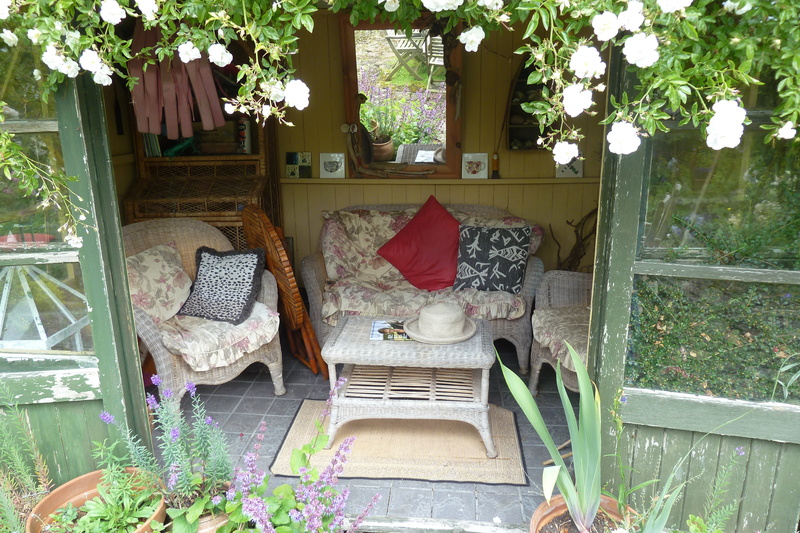 An avid gardener uses her shed for guests when she hosts garden tours. Much like casitas (a separate small building next to a home) that are popular in the south, sheds may soon serve the same purpose here in the Midwest. Be it a social gathering point – think a bar building next to a pool (a Bar Shed), or a cozy backyard shed to serve as a personal retreat (yoga sheds, reading rooms and craft rooms have all been called She Sheds) – the idea is gaining interest among suburbanites and urbanites alike.